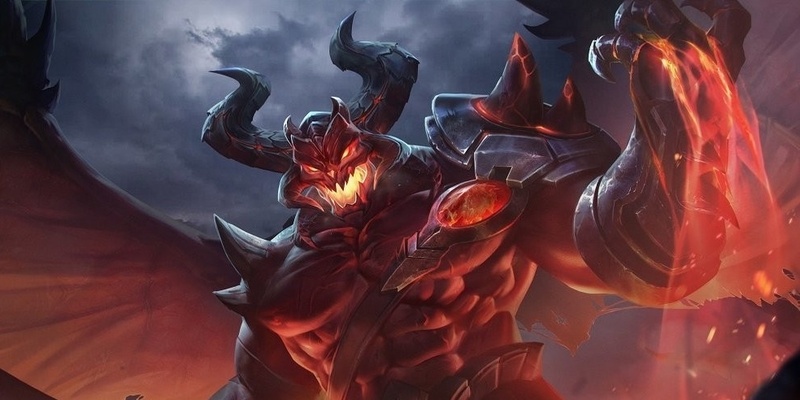 Guide for the hero Maloch, a playable character in Arena of Valor (AoV). Included are Maloch’s abilities, statistics, attributes, strengths, weaknesses, and more. These are Maloch’s attributes on the mobile version of Arena of Valor. Click here for his attributes on the Nintendo Switch version. Maloch has a longer attack range than other melee units. When his weapon is enchanted, his normal attacks deal 1.0 ADˀ true damage instead of physical damage and restore 2% of his lost HP (+0.15 additional AD bonus). Maloch swings his blade and deals 370/480/590/700/810/920 (+1.8 AD) physical damage. If he hits a hero, his weapon becomes enchanted. When his weapon is enchanted, Cleave will deal true damage and recover 6% (+0.3 additional AD bonus) (up to 24%) of his own lost HP for every hero it hits. Has an 80-millisecond delay before hitting an enemy. Maloch snatches the souls of the surrounding enemies, dealing a small amount of physical damage and reducing their movement speed by 30% for 3 seconds. He gains a shield for snatching souls, absorbing up to 600/800/1000/1200/1400/1600 (+2.8 AD) damage taken with 4 snatched souls. Maloch unleashes a massacre from above at the specified location. He knocks nearby enemies when he lands and deals 420/525/630 (+1.2 AD) physical damage. Also reduces the movement speed of any enemy that tries to enter or exit the zone. Has a delay of about 1.70 seconds before hitting the target. Use Maloch’s Cleave to hit an enemy hero and enchant his weapon. This will make his normal attacks and subsequent Cleave attacks deal true damage and restore a lot of HP. Our recommended order for Maloch abilities as he levels up. See all of Maloch’s item builds. Hey, do you know if Maloch is coming to tombola again, or maybe in the shop? Because currently he isn’t available at all on europe Servers. Tencent have said that he will be added to the normal hero store at a later date. He will not be added to the lucky draw/Tombola again. Maloch should be coming to stores May 2nd. According to the Europe servers, they already had Xenial and Toro before us however Wisp came out at the same time for both of us and Maloch’s release date was May 2nd in he Europe server. So, we can assume that he will be released then.